KUALA LUMPUR, Malaysia (AP) — Appearing calm and solemn, two young women accused of smearing VX nerve agent on Kim Jong Nam, the estranged half brother of North Korea’s leader, were charged with murder Wednesday. “I understand but I am not guilty,” Vietnamese suspect Doan Thi Huong told the court in English after the murder charge was read. She looked briefly at the public gallery as she was led out and bowed her head. 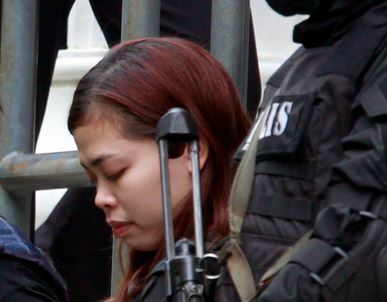 The other suspect, Indonesian Siti Aisyah, nodded as her translator told her: “You are accused of murdering a North Korean man at the departure hall” of Kuala Lumpur International Airport. She was dressed in a red T-shirt and jeans. The attack was caught on grainy airport surveillance video; Huong was seen clearly in a T-shirt with “LOL” emblazoned across the front. Gooi Soon Seng, Aisyah’s lawyer, spoke to his client for the first time Wednesday. “Her eyes were red and she says she’s innocent,” he said. Meanwhile, Kim’s corpse is at the center of a growing diplomatic battle between North Korea and Malaysia. Authorities are seeking seven other North Korean suspects, four of whom fled the country the day of Kim’s death and are believed to be back in North Korea. Others sought include the second secretary of North Korea’s embassy and an employee of North Korea’s state-owned airline, Air Koryo.